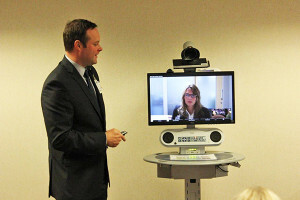 Spectrum Health United and Kelsey Hospitals have added telehealth services—which uses interactive video-conferencing to connect providers and patients to clinical services and education programs at distant sites. Patients can now avoid travel times and reduce travel expenses and still access the care they need. Telehealth patients have a live, real-time interaction with a physician who provides specialized care, follow-up appointments and education that may not be offered locally. This technology gives physicians the ability to obtain sufficient examinations of patients by questioning them about their past health history and current symptoms, and by using electronic diagnostic equipment and peripheral cameras. The telehealth program at United and Kelsey Hospitals began with virtual cardiology services. The program has grown to provide specialist consults in cardiology and oncology between United Hospital, Kelsey Hospital and Spectrum Health medical facilities in Grand Rapids. The program will soon include diabetes education, stroke specialist access, a virtual wound clinic and primary care provider e-visits to local communities.